Welcome to TaraRulz.com, the oldest and largest website dedicated to the 1998 Olympic, 1997 World and National, World Professional figure skating champion, and current NBC broadcaster, Tara Lipinski. Working hand and hand with Tara, we strive to be your number one source for fans across the globe for news, photos, and more, including the largest photo gallery on the web. Thank you for visiting and come again soon! All photos and videos belong to their respective owners. No copyright infringment intended. Contributions are always accepted and appreciated. Header photos are copyright Tara Lipinski. "Tara Lipinski and Johnny Weir Say 2018 Olympians Are Doing Things 'We Didn't Think We'd See in Our Lifetimes'"
"Tara Lipinski and Johnny Weir Open Up About Their Unique Bond: 'There's No Relationship More Special'"
At 35, Tara Lipinski has competed in the winter Olympics, won a gold medal in the ladies� singles competition, and been cast in film and television roles. But despite all she�s accomplished, none of it compares to her relationship with husband Todd Kapostasy. After meeting at the Sports Emmys in May 2015, Kapostasy a Fox Sports producer, proposed to Lipinski that December. The couple wed last July at the historic Middleton Place plantation in Charleston, South Carolina. �I think as much as I love skating, love everything that I�ve accomplished, love working in television, being married trumps all of that, and it�s been really nice to have that balance,� she said. And now that the PyeongChang winter games have wrapped, where she and BFF Johnny Weir served as commentators for the figure skating events, Lipinski and Kapostasy likely have their post-Olympic plans already figured out. Lipinski became the youngest winner of an individual Olympic event in history at the age of 15 during the 1998 Nagano games. 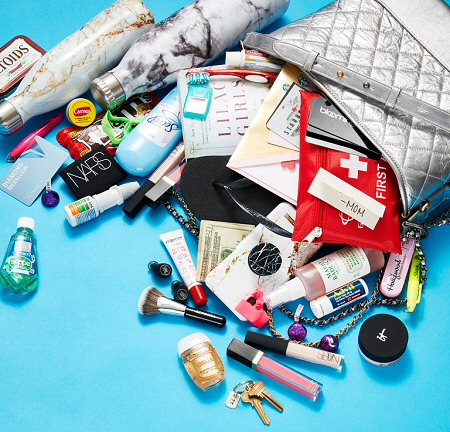 TARA LIPINSKI: WHATS IN MY BAG? Mom�s notes earn high praise from Tara Lipinski. The Olympic figure skater-NBC commentator �always� has a missive from her �best friend� tucked in her quilted Chanel hobo. �I�ll keep the most recent until I get the next,� the 35-year-old, wed to TV producer Todd Kapostasy, explains. What else is inside Lipinski�s bag? A Valentino Rockstud Zip-Around Wallet in red; an iPhone X; a phone charger; a Louis Vuitton Cosmetic Pouch in coquelicot; JBL Free earphones; two NARS Radiant Creamy Concealers; a NARS Mini Blush & Bronzer Duo; two Tom Ford Ultra Shine Lip Glosses in Sugar Pink; a mini Sephora makeup brush; IT Cosmetics Bye Bye Pores; a C.O. Bigelow Rosebud Salve; a Burts Bees lip balm; Carmex; Aquaphor; a Bath & Body Works Qarm Vanilla Sugar PocketBac Sanitizer; Lilac Girls by Martha Hall Kelly; a 20 dollar bill; a Soho House card; a Delta Diamond Medallion card; three Bloomingdale�s gift cards; a little Olympic Association charm; Zicam; a travel-sized tube of Advil; Secret deodorant in Powder Fresh; a travel-size bottle of Scope; a Colgate toothbrush; a travel-size Colgate toothpaste; Listerine strips; Cinnamon Altoids; fashion strips; pens and mini Sharpie highlighters. To many viewers, NBC figure skating analysts Tara Lipinski and Johnny Weir are Olympic darlings � a one-stop shop for knowledge, sass and brass. Others, however, reach for their ear plugs, calling the duo mean, obnoxious and distracting. This debate resurfaces every time Lipinski and Weir appear on television. Weir and Lipinski took over NBC�s flagship commentating perch in PyeongChang, amplifying the discussion. The duo replaced familiar figure skating broadcaster Scott Hamilton in the primetime slot, which he had held for decades (he can still be seen elsewhere in NBC�s coverage). Hamilton, 59, was typically more measured in his on-air remarks. That style, for better or worse, began to fade during the Sochi Olympics, when Lipinski and Weir debuted on NBC�s cable network, NBCSN. The mainstream media (including The Post) has tended to agree. �The commentary combo [of Lipinski and Weir] is more of a reason to tune in to the Winter Olympics than the individuals and pairs populating the competition itself,� wrote USA Today this month. The Hollywood Reporter described the pair�s tone as �wonderful cattiness.� Even the Wall Street Journal gave them a glowing review, while the New York Times toured their PyeongChang hotel room. The public�s commentary on the commentators, however, seems to be endlessly divisive. Common debate topics include Weir�s outfits (�Weir looks like he should be hosting the hunger games�), their broadcast partner Terry Gannon (�I feel sorry for [him]�) and, ultimately, whether to deploy the mute button or not. Weir isn�t shy, or apologetic, about what he and Lipinski are trying to accomplish. Whether you appreciate Lipinski�s and Weir�s �truth� � and their newfangled approach � it appears they�re here for the long haul. Aside from anchoring the final figure skating competition Thursday night (the women�s free skate), and the exhibition gala over the weekend, NBC announced that Lipinski, Weir and Gannon will also host coverage of the PyeongChang Closing Ceremonies this weekend. The reaction to this news? Predictably, it was both joy and agony. �Just when I thought the coverage couldn�t get worse,� wrote another. �Excellent choice!! !� wrote a fan. �Swell. I guess I�m skipping the Closing Ceremonies then,� wrote a non-fan. When the Olympics officially end, fans of Tara and Johnny will have to get their fix elsewhere (perhaps at the Kentucky Derby, or in the recording studio). Haters, on the other hand, can look forward to finally being able to raise the volume on their TVs. "Leslie Jones brought some Team USA gear with her, but Tara and Johnny have her missing piece." Figure skating analysts Tara Lipinski and Johnny Weir will host the Closing Ceremony on Sunday night in Primetime on NBC. The team, along with play-by-play partner Terry Gannon, made the announcement during Tuesday night�s broadcast of the ladies� short program. �Parades, K-Pop, fireworks, costumes, dancing � who better to host the world�s biggest party than Tara, Johnny and Terry,� Jim Bell, President, NBC Olympics Production and Programming, said in a press release. Lipinski and Weir are known for having more fun than anyone else at the Olympics. They recently gave a glitter makeover to Saturday Night Live star Leslie Jones and learned more about K-Pop in Korean culture. "Tara and Johnny get up close and personal with Korean superstar Eric Nam to learn about what makes K-pop such an international sensation." Tara Lipinski may no longer be competing for gold, but that doesn�t mean that she doesn�t serve some major looks with fellow figure skating commentator Johnny Weir at the 2018 Winter Olympics in PyeongChang. The duo kills it with the banter, but somehow, they also manage to look amazing rink-side. Stylish caught up with Lipinski to get the scoop on just how many bags she and Weir brought with them for the festivities, their favorite looks they�ve worn thus far and the sartorial tradition they created for the women�s finale! For the amount of outfits seen on screen (and at press events), you�d imagine that Lipinski and Weir travel with some major cargo� and you�d be right. According to the former figure skater, they brought 21 suitcases total to house all of their possibilities for outfit changes. �We never know how many costumes changes but we have a rule never to rewear an outfit. So that�s why we bring our whole lives in our suitcases! We also like to match which adds another layer to packing process,� she explains. Clearly, Lipinski and Weir like to bring a ton of options � but how do they get camera ready? Well, it comes down to preparing their ensembles the night before. �We decide what the vibe will be for the event and then we start mixing and matching,� says Lipinski. And if you thought that glam before their daily appearances would be low key � think again. They do two hours of hair and makeup. But don�t worry, they keep it fun: �We have a speaker we bring with us for impromptu dance parties. Pre-show warmups!� she says. And she also dished that Johnny�s hair takes longer! If you�re gearing up for the women�s figure skating final, get ready, because they have a super adorable tradition that Johnny created: they always wear gold. See � once champions, always champions when it comes to style. "Tara Lipinski and Johnny Weir, the former figure skaters who are now NBC broadcast partners, take us through their Olympic wardrobes. FEBRUARY 17, 2018"
"Tara Lipinski and Johnny Weir pose following the Figure Skating Men Free Program on day eight of the PyeongChang 2018 Winter Olympic Games at Gangneung Ice Arena in Gangneung, Pyeongchang, South Korea. FEBRUUARY 17, 2018"
"Tara Lipinski and Johnny Weir pose following the Figure Skating Men Short Program on day seven of the PyeongChang 2018 Winter Olympic Games at Gangneung Ice Arena in Gangneung, Pyeongchang, South Korea. FEBRUUARY 16, 2018"
"Johnny Weir, Tara Lipinski and Terry Gannon comment for NBC the Figure Skating Pair Skating Free Program on day six of the PyeongChang 2018 Winter Olympic Games at Gangneung Ice Arena in Gangneung, Pyeongchang, South Korea. FEBRUUARY 15, 2018"
"Tara Lipinski and Johnny Weir pose after commentating for NBC the Pair Short Program figure skating event during the 2018 Winter Olympic Games at Gangneung Ice Arena in Gangneung, Pyeongchang, South Korea. FEBRUUARY 14, 2018"
"NBC analysts Johnny Weir, Tara Lipinski and Scott Hamilton are busy on social media during the Figure Skating Team Event during the 2018 Winter Olympic Games at Gangneung Ice Arena in Gangneung, Pyeongchang, South Korea. FEBRUUARY 12, 2018"
"Journalist Terry Gannon, Tara Lipinski and Johnny Weir comment for NBC Sports the Figure Skating Team Event during the 2018 Winter Olympic Games at Gangneung Ice Arena in Gangneung, Pyeongchang, South Korea. FEBRUUARY 11, 2018"
�Saturday Night Live� comedian Jones joined Olympians-turned-NBC analysts Lipinski and Weir to bust out some moves to Queen Bey�s 2003 hit in a hallway. "Ice skating commentary duo and BFFs Tara Lipinski and Johnny Weir get points for style with Gwen Stefani�s �Hollaback Girl� and Lady Gaga�s �Paparazzi.� "
"Tara Lipinski, 1998 Olympic champion Ladies' singles figure skater and commentator and analyst on NBC at the PyeongChang 2018 Olympic Winter Games, talks to Jenny McCarthy about the impact that Tonya Harding and Nancy Kerrigan had on the sport, the intense training necessary to compete on the Olympic level, working with Johnny Weir, and what to expect at this year's games."